If you are one of the 13% of employees in the United States working in sales, you know that even for the most natural salesperson, it can sometimes be difficult to turn potential leads into closed sales. Across different industries, you need different skills and different knowledge to prove to your potential customers that your solution is best for their particular problem. The seven-step sales process outlined in business textbooks is a good start, especially since 40% of sales teams don’t have a playbook—and a playbook or sales strategy makes you 33% more likely to close sales at a higher rate. The seven-step sales process is only a good start, though, because you need to customize it to your particular business—and, more importantly, to your target customers as you move them through the sales funnel. As the old adage goes, “Learn the rules like a pro so you can break them like an artist.” Once you’ve mastered the seven steps of the sales process you might learn in a business class or sales seminar, then you can break the rules where necessary to create a sales process that, like a rogue cop in a bad TV show, doesn’t follow procedure but gets results. What are the seven steps of the sales process according to most sales masters? The following steps provide a good outline for what you should be doing to find potential customers, close the sale, and retain your clients for repeat business and referrals in the future. The first of the seven steps in the sales process is prospecting. In this stage, you find potential customers and determine whether they have a need for your product or service—and whether they can afford what you offer. Evaluating whether the customers need your product or service and can afford it is known as qualifying. The second stage has you in preparation for initial contact with a potential customer, researching the market and collecting all relevant information regarding your product or service. At this point, you develop your sales presentation and tailor it to your potential client’s particular needs. In the approach stage, you make first contact with your client. Sometimes this is a face-to-face meeting, sometimes it’s over the phone. There are three common approach methods. In the presentation phase, you actively demonstrate how your product or service meets the needs of your potential customer. The word presentation implies using PowerPoint and giving a salesy spiel, but it doesn’t always have to be that way—you should actively listen to your customer’s needs and then act and react accordingly. Perhaps the most underrated of the seven steps of a sales process is handling objections. This is where you listen to your prospect’s concerns and address them. It’s also where many unsuccessful salespeople drop out of the process—44% of salespeople abandoning pursuit after one rejection, 22% after two rejections, 14% after three, and 12% after four, even though 80% of sales require at least five follow-ups to convert. Successfully handling objections and alleviating concerns separates good salespeople from bad and great from good. In the closing stage, you get the decision from the client to move forward. Depending on your business, you might try one of these three closing strategies. Once you have closed the sale, your job is not done. The follow-up stage keeps you in contact with customers you have closed, not only for potential repeat business but for referrals as well. And since retaining current customers is six to seven times less costly than acquiring new ones, maintaining relationships is key. Sales process takeaways: What’s important? 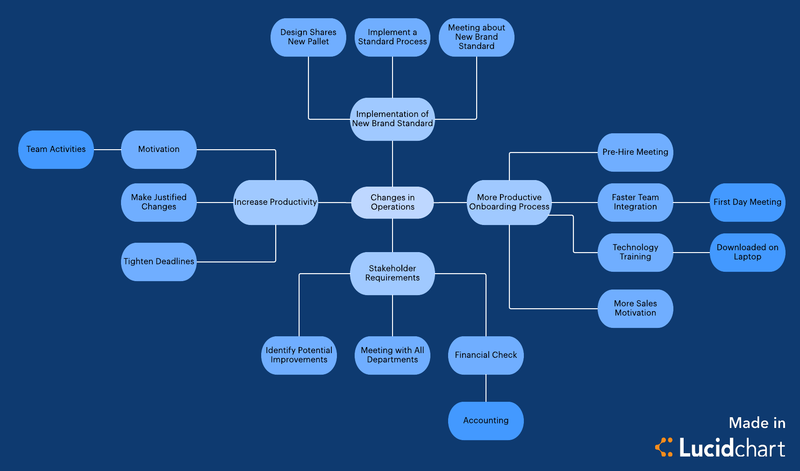 Now that you understand the basic seven stages of sales process development, you can begin to tailor them to your own product or service and customer base. Cut out steps that are unnecessary to your particular business and focus on your customer. You know the rules—now get ready to break them in ways that bring you closer to your customer and turn you from a sales professional to a sales artist. You have a product or service you want to sell—now what? Anyone with a problem related to your area of expertise can be a potential customer. Brainstorm possible problems that your product or service can solve. It can help to create a Lucidchart mind map to organize your thoughts. 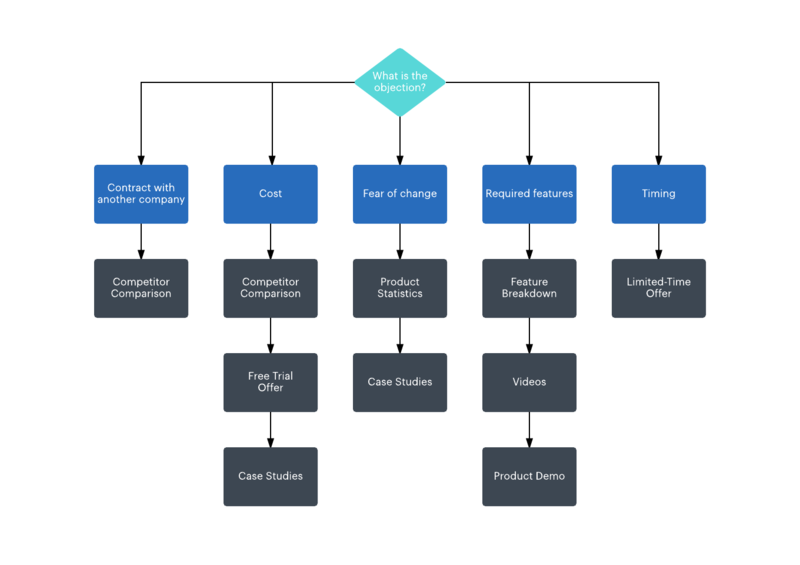 Once you have found problems for your products to solve, it’s time to tailor your offerings to fix those issues—and be prepared to explain how your product truly is a solution for the given problems. You can use Lucidchart to create a flowchart showing how your product or service solves client problems and makes their lives easier. 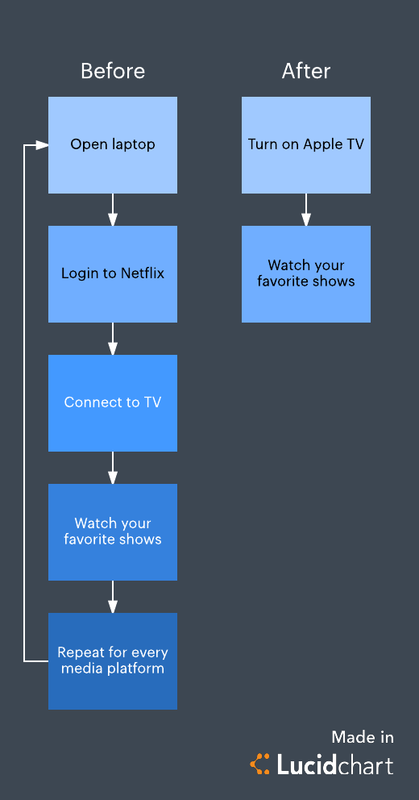 Now that you have flowcharts or other illustrations ready, you can more easily present the solution to your customer using Lucid’s new Google Slides add-on. Following up isn’t just for after the close to get repeat business. As stated before, most customers don’t buy right away. You have to handle objections and try, try, try again. This is where the seven-step sales process doesn’t account for repeated approaches, presentations, meetings, or phone calls where you handle objections. If it did, it might be a 13-step sales process or a 21-step sales process or… you get the idea. It’s a good idea to set up a calendar for repeated contact with potential, present, and past customers. Lucidchart allows you to create calendars and checklists to stay organized so that you don’t have to worry about keeping track of everything in your mind as you’re making calls, sending emails, and visiting prospects. Once you’ve tried out a few different approaches, tweaking the original seven steps in the sales process to fit your customers better, you should document your new procedures so that you can follow the steps that work best and easily get new reps up to speed as they are onboarded. Sign up for a free Lucidchart account and get started using our visual productivity platform. But remember, just because you’ve come up with some new rules, you shouldn’t be afraid to break them. 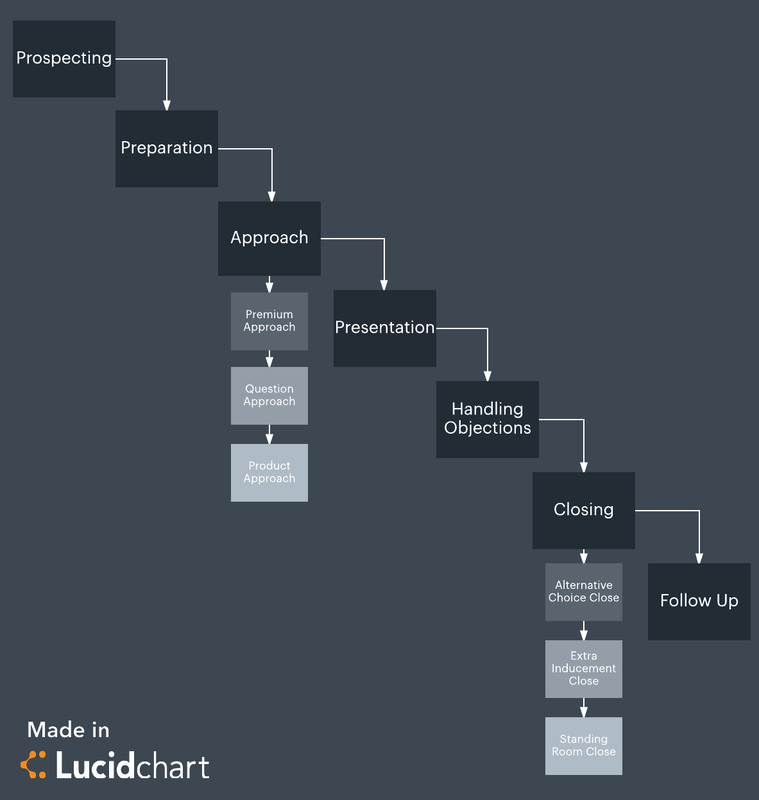 What are the seven steps in the sales process? Whatever your customers need them to be.